This week Katrin of Sea Watch Foundation tells us how Jacques Cousteau documentaries and travel sparked her interest in the oceans. What Katrin didn’t realise was just how hard it would be when starting out, if she had she would have started volunteering and gaining practical experience much earlier on and definitely taken more statistic classes! 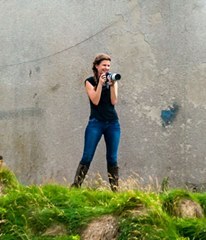 The opportunities to gain experience are out there and it is so worthwhile getting involved. I remember as a child I frequently watched Jacques Cousteau documentaries with my parents and was fascinated by the amazing wildlife on these programs. From an early age, my parents travelled with me so I experienced fantastic places and wildlife; when I was six and we lived in Oman for a while and I got to witness sea turtles coming onto land to lay their eggs – and later on hatchlings returning to sea. It’s very hard not to take an interest in the ocean when you have had an experience like that! I am originally from Germany and when researching marine biology careers, I quickly found that the UK seemed to offer a greater variety of more specialised courses than Germany, so I went to Bangor, Wales, to study Marine Biology/Zoology at undergraduate level initially. I did some volunteering during my degree but it soon became clear to me that gaining practical field experience would be essential, so after graduating, I took a year off and spent several months in Florida with Mote Marine Laboratory working as an intern in manatee and bottlenose dolphin research while applying for MSc courses. The following year, I started my MSc in Animal Behaviour and Welfare. After I graduated, I volunteered with a variety of marine mammal projects around Europe, including a six month internship with the Sea Watch Foundation as Research Assistant and Intern Coordinator. After completing my internship I became a voluntary Regional Group Coordinator, organising watches and events for Sea Watch in North West England. I applied for funding through the Vodafone World of a Difference program which sponsored people who ‘donated themselves’ to charities, to support me in this position and was able to turn it into a part time job. This is my second position with Sea Watch. 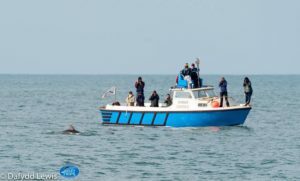 I started full time work with Sea Watch as the Wales Development Officer, the aim was to engage local people and build up a voluntary cetacean sightings network in Wales. I was already working with Sea Watch at the time on a voluntary basis and my role as North West coordinator was very similar so I thought I stood a good chance of applying – and apparently I was right! I worked in this role for nearly 2 years and while I enjoyed it I was keen to get more involved in the research side of things. Luckily for me, just as the contract was coming to an end, the position of Monitoring Officer opened up in New Quay and that is what I’ve been doing ever since! As most people, I think, I most enjoy the field work, despite having close encounters with dolphins on a regular basis, it’s still an amazing experience to be able to observe them up close. 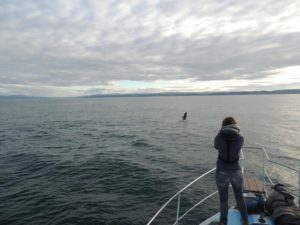 Some surveys are better than others but there’s usually always a moment that makes the long days on the boat worthwhile; dolphins chasing fish at the surface, breaching spectacularly through the air, bowriding or even tossing a jellyfish in your direction. My favourite encounters are definitely those in perfect sea states when you can see the animals through the water, gliding by underneath the boat and looking up at you. Leaps are great fun but when you see them underwater you are seeing them in their element and it’s great to be able to be part of that even for just a moment. Definitely. Most of our work in the last years has been funded by Natural Resources Wales; we submit annual reports to them to help assess the status of our bottlenose dolphin population and advise them on the management of the Special Areas of Conservation in Cardigan Bay. I have also worked on data submitted to the JNCC in support of proposals for Special Areas of Conservation for harbour porpoise so I do really feel like our work is making a difference! 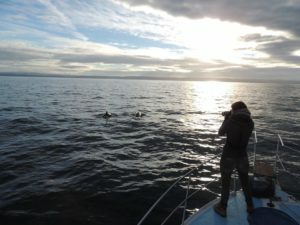 I was always aware that finding a job in marine mammal science was not going to be easy, however, I don’t think I realised just how hard it would be when I was starting out or I would have started volunteering and gaining practical experience much earlier on! There are a lot of amazing people out there who want to work in this field, it is very hard to stand out and it can become very demoralising after a while if all you have to show for your hard work are letters of rejection – or no response at all. I think if I could go back, I’d definitely also take more statistic classes! People skills. I’m not a naturally sociable person and I didn’t think I’d have to be to work with data or dolphins but being comfortable networking and liaising with people is definitely an advantage. It might not come naturally to you, it certainly doesn’t to me, but practice does go a long way to make it easier! Get as much experience as you can. Sadly a lot of volunteering in this field is unpaid so it can be difficult but you don’t necessarily need to do full time unpaid internship; many marine conservation charities (such as Sea Watch! ), also have regional groups or home based tasks that you can get involved with and all it will cost you is time. Not only will you gain new skills and help a good cause, but you may also meet people who can give you advice and may know of other opportunities you may not otherwise have heard of. This is a difficult question as there are so many to choose from but obviously bottlenose dolphins have a special place in my heart; they may be one of the most commonly seen dolphin species but they are also highly intelligent and show complex behaviour such as specialised hunting techniques and tool use. That would have to be seeing killer whales in British Columbia. I had wanted to see killer whales for years and always missed out by days on the whale watching trips I had previously been on. One of my favourite popular science books is Listening to Whales by Alexandra Morton who studied the resident population in that area and from her detailed account of her work with some of these incredible individuals, I felt like I knew them personally, so getting to see Ruffles and Granny, the oldest known orca, in person was just an amazing experience. I don’t think I would be half as excited about meeting a human celebrity! Thanks for the great advice Katrin! You can also hear from Kathy James from Sea Watch Foundation both ladies suggest getting involved and Sea Watch run internships so get involved. 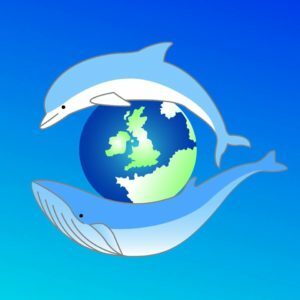 Right now Sea Watch Foundation are looking for people to get involved in their National Whale & Dolphin Watch 2017.